Today I am sharing with all of you my review on the delicious Lemon Chicken Breast Cutlets from Sunrise Specialty Foods. Each cutlet is 5 oz. and they are sold in packages of 4 or 16. Just a piece of advice...this chicken is some of the best I've ever had so please consider ordering the 16 piece set. Once you try it, you will definitely want more! This boneless, skinless chicken breast cutlets are marinated in a delicious lemon herbal sauce. It is their #1 best selling chicken recipe! After just one taste of this, you will completely understand why it is a best seller! The chicken comes vacuum packed, frozen and in a cooler with a lot of dry ice. Ours arrived perfectly frozen and had absolutely NO frost on it whatsoever! These chicken breast cutlets are perfectly trimmed and the 5 oz. portion size is just perfect. We decided to bake ours in the oven on 350 degrees F. and within 35-40 minutes our dinner was done. The entire time they were baking, you could smell deliciousness coming from inside our oven so we knew we were in for an awesome treat once they were done. They were very flavorful, moist and were easy to cut with a fork. The texture was smooth and the seasoning was just perfect! Hubby and I quickly cobbled them up (yes, we each had two) and left the table with our tummy's very happy & satisfied. It is nice when you can prepare a gourmet meal and all of the work is done for you, except the baking! Seriously, the Lemon Chicken is some of the best chicken we have ever had. That includes high-end meals at a fine restaurant or meals made here at home. This chicken rocks!!! A definitely must-try! 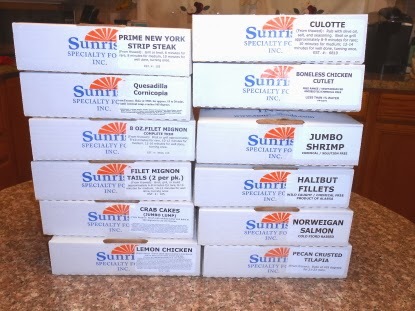 Reader's Coupon Code: Place any size order and get either 2 FREE Jumbo Lump Crab Cakes or 4 FREE Pecan Crusted Tilapia. In the comment section of the order form you will want to put one of these two coupon codes: Classy/Cakes or Classy/Pecan to get it! Yay! You will love them!!! This coupon expires 06-30-2014.